We probably all know someone like this. It’s not that you don’t enjoy talking to them, it’s just that they call a lot… and the calls always last a long time… and they have a hard time taking subtle hints that you are busy and need to hang up. “Okay, I gotta go…” (more talking) “Well it was nice talking to you…” (more talking) “Well I better let you go…” If none of this sounds familiar, YOU may be the one that people are trying to escape from. Man, Biff has got to rack up costs buying new cords. It seems that Biff would have an enormous arsenal of excuses to get off the phone. I mean, what could Biff possibly say to a relative that would not be believable as an excuse, he’s a magnet for absurd incidents. Then again, looking at the past few comics, with all the different phones Biff has he probably doesn’t mind destroying one. Heh. I always warn people beforehand that they must NOT wait for me to finish because I never will. Hmm…if it hasn’t already been said, it seems to be phone week. If it has, then I’ll hush. And this is why I always, always, ALWAYS let my mom go to voicemail. I don’t get it, what’s this week’s theme? I gotta give my grandpa credit. he LOVES to hear from me, absolutely loves it, but is satisfied with a call every week or so and doesn’t like to take more than five or ten minutes on the phone. He’s like me. Loves his family, just hates talking on the phone. I love the man. My grandparents on my father’s side. Both my boyfriend’s sets of grandparents. One of my aunt’s on my mother’s side. It is all terrible. Wait, wait, Biff has relatives? If they’re anything like him, the Biffverse must be a very strange place indeed, with people hanging out on rooftops to cook popcorn with a lightning bolt, or driving invisible green cars around. My aunt. She’s the kind of person who laughs at her own jokes (which aren’t even remotely funny), drops by unannounced at random times, and has an obnoxious, loud, armor-piercing laugh. The only thing more grating on the nerves than that laugh is automatic gunfire. Actually, I think I’d prefer the latter. I haven’t talked to her in a while, but one of my grand mothers is like that. Whenever she calls, my dad spares me and my brother the hassle of talking to her. Gawd, this woman called me up once to see if my mum was in, nothing else, and ended up talking at my for 30 minutes. I’ve forgotten what i did to shut her up, but it was probably someting like shoud “OH MY GODD!” and bash the phone against the wall. Be an introvert. It rocks. Biff’s solution is abuot what I need, every time my mother calls. THERE’S A FAMILY OF BIFFS. my roomate’s mother called (who to this day I have yet to meet) looking for him. He was playing chess and didn’t want to talk to her. I said he wasn’t there, and she talked to me for 45 minutes. My roomate was sitting there laughing at me. I can’t say that I’d ever do that to a family member, but I’ve actually considered cutting my phone line whenever a person calls asking me to talk a “short” survey. I actually did take the “short” survey once. I took me about 50 minutes to finish. Okay, but what if your phone’s cordless? I guess there’s always the old “You’re breaking up! Sknxxx!” approach. Oh, and I agree that the thought of Biff’s relatives (Hey, he had to come from SOMEWHERE.) is both fascinating and a little scary. Initially I found the idea of Biff having relatives to be somewhat disconcerting, but the more I thought about it, the more it grew on me. Imagine the family reunions! Hang up in the middle of your own sentence. Non-stop talkers can’t comprehend that someone might actually do that. Then take the phone off the hook for 10-15 minutes. Hee, now there’s a quick and decisive decision! Cut those wires, Biff! I have call waiting, and a great aunt who never, NEVER shuts up. Thankfully, the one saves me from the other. When she starts in, I pull out my cell, call myself, and say, “Oh, I’m sorry! I’ve got a call on the other line. It might be something with work; I have to go!” Works like a charm, except for the one time my cell was dead. That was a three hour marathon call. Literally. (I timed it by playing endless rounds of Tetris online). Do you think Biff gets invited to family reunions? 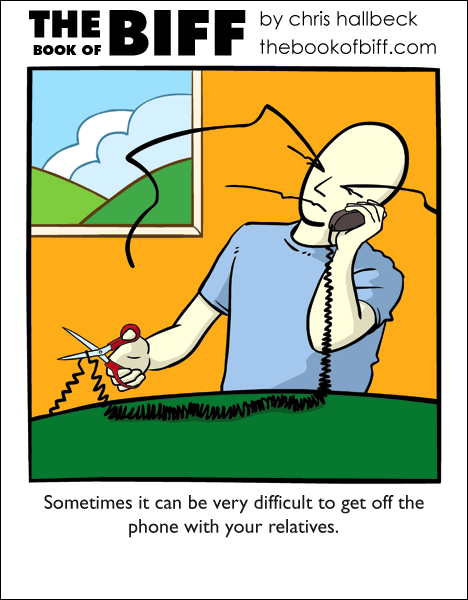 Wow, everyone likes to talk about hanging up on relative- how rude! . . . And the all the more I can relate to everyone. I never–maybe rarely–have to hang up on people; and if I call someone else, it lasts five minutes when I have difficulty getting off the line. Although, I know a lonely old lady who calls the house occasionally, but she is always looking for someone else. If you visit, though, she will talk your ear off. Although, I did walk out on a dentist’s appointment once–the appointment was at 8; I had class at 10:30 or 11. We arrived on time. I had to leave after only five minutes sitting in the chair waiting for the exam, it took them that long to call me back. Wow this happened to me just today. Well, not on the phone. My relatives are in town from California and they wouldn’t stop talking. The worst is when you say you can’t have a long phone conversation then you guet sucked into a 2 hour talk. I just finished reading through the archives, WOOT! Anyhow, nice comic, good phoneweek, and I can’t wait to add this to my list of daily webcomics. Biff has relatives, huh? That’s the strongest indication so far that he’s not the only person in the world. Though we have yet to actually see anyone. . .
People need to learn to take a bleeding hint. Relatives are family and they are loved, but no one wants to talk on the phone to anyone for two hours apart from teenage girls. And even back then I would rather have talked to someone in person. The flip side of this is that people should visit/communicate with their relatives more often, that way the phone calls wouldn’t need to be so long. Oh god, I get this with my grandma ALL THE TIME. Argh. It drives me nuts. i guess biff doesn’t have to worry about the phone. I have an odd version of this with my mother. She’ll often be the one to say “I’ve got to get going now” but then she’ll talk for another 10 minutes, and after that say “Right, I’ve really got to get going now”. This will often be repeated up to 4 times before we actually hang up on each other.